Brexit dominated again this week and as usual, so did the same tired responses from the Prime Minister. Stephen Kerr (Conservative) then stood and stated that the United Kingdom was the most successful political union the world has ever known. 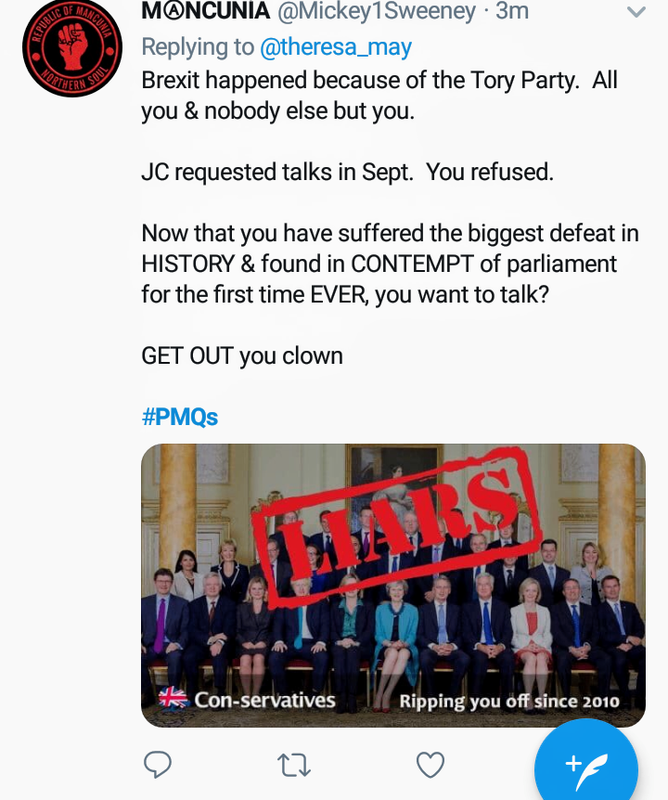 Once the weekly Conservative primping hyperbole was out of the way Jeremy Corbyn stood at the despatch box to ask questions he must know by now will never be answered. 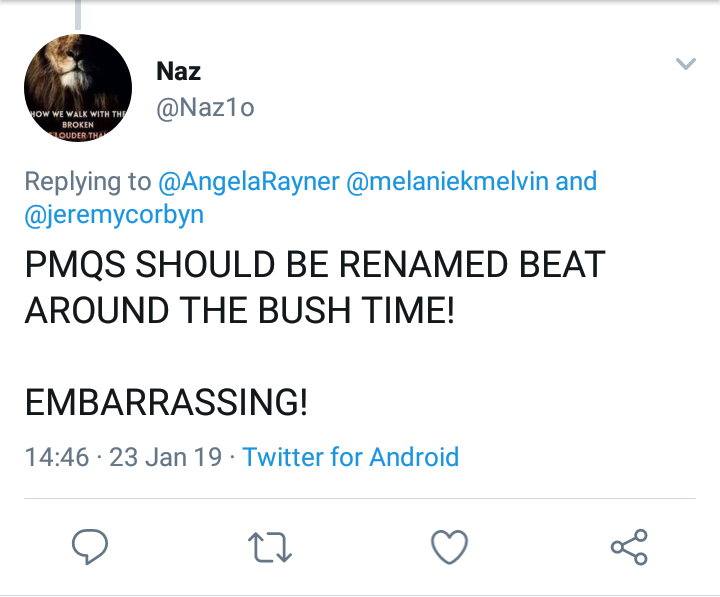 Jeremy Corbyn began by mentioning Holocaust Memorial Day and condemned antisemitism and racism and that we should do everything we can to avoid horrors like this happening ever again. In a nutshell, Theresa May replied that the amendments do not solve the issue, because they just delay Brexit. May stood at the dispatch box and mocked Jeremy Corbyn for not being precise enough stating the question is… “What does Labour mean by staying in the customs union?” She then proceeded to recite a number of options for a customs Union and said she would like to talk to Corbyn about it but if he won’t talk about it perhaps he hasn’t got a clue. Perhaps Theresa May forgot it was PMQs and she isn’t meant to be asking questions but answering them? May belittled the leader of the opposition by saying she will try to help Corbyn out… She said businesses want to be able to export to the EU without facing tariffs or rules-of-origin checks. Her deal allows that, but also allows the UK to strike its own trade deals. Theresa May stated that she wants a deal that protects jobs. 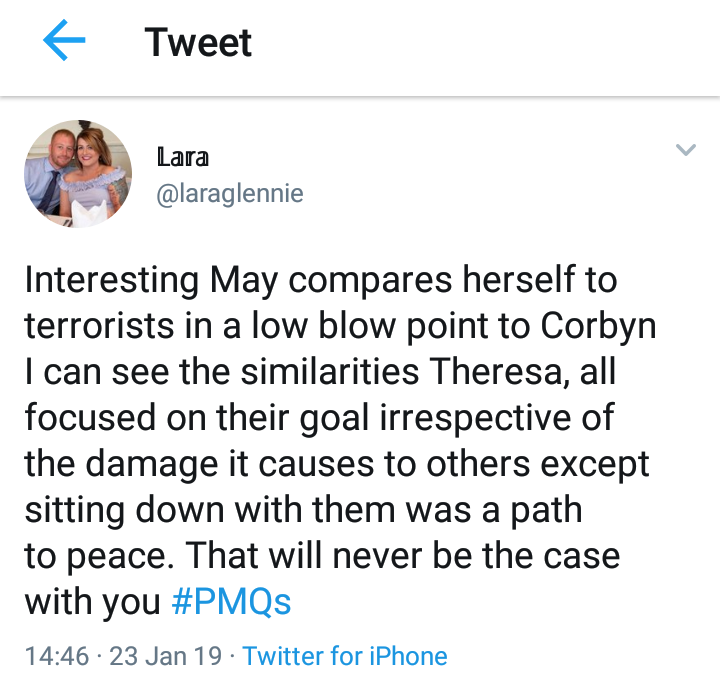 She then had the brass neck to say Corbyn stands up and uses these phrases but he does not know what those phrases mean… She then went on to say she noticed that Corbyn hadn’t mentioned the increased employment figures released this week. Jeremy retaliated by saying May has not mentioned increased in-work poverty and growing debt. He went on to repeat that her door may be open, but minds are closed. He highlighted that a third of her government are at the billionaires’ jamboree in Davos. Watch Our friend Peter Stafonvich put this straight for you. Once again Corbyn came out on top because he asked reasonable questions but received no reasonable responses. 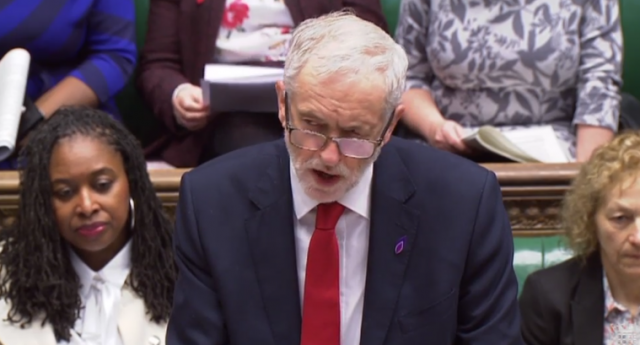 Theresa May spent her time evading the questions, mocking the leader of the opposition, even to the point of questioning his ability to understand what he was talking about. Jeremy asked some crucial questions regarding amendments which are designed to rule out a no-deal Brexit if they are passed and May avoided giving any clear answer, only stating that extending article 50 does not rule out no-deal as it just postpones the decision period. The PM spent much of her answers flogging Jeremy Corbyn for his decision to impose preconditions on no-deal before he will meet with her to discuss her deal. The Commons seemed more peaceful this week with much less hollering and abuse directed at Jeremy Corbyn, it looks like the Tories decreased numbers in the house due to a ‘billionaires jamboree’ as Jeremy called it has had one positive impact in the house.